Before Disney Bought LucasFilm for millions of dollars back in 2012 and started production on Star Wars: The Force Awakens, original franchise creator George Lucas was looking to expand his galactic empire with a live-action TV show. Scripts had been written, and it sounded as though production was ready to start. They just needed funding. But once the Mouse House took control, this impending series all but disappeared and we didn't hear anything else about it. But guess what? It's not dead. Not entirely. This weekly one hour sci-fi adventure drama was going under the working title Star Wars: Underworld. George Lucas and his team had reportedly created over 100 scripts for this series. And now, it sounds like LucasFilm has kept those close by, and may utilize them sometime in the near future. This comes along with news that the discarded video game Star Wars 1313 might also get resurrected. Though it's not clear if they will be turned into their respective show and game, or if the ideas contained in each will be spread across the vast universe of movies currently in production. Here's what Kathleen Kennedy had to say to /film when asked if these projects were dead. "No. No, interestingly enough, that's an area we've spent a lot of time; reading through the material that he developed is something we very much would like to explore. And there was 1313 the game...So our attitude is, we don't want to throw any of that stuff away. It's gold. And it's something we're spending a lot of time looking at, pouring through, discussing, and we may very well develop those things further. We definitely want to." 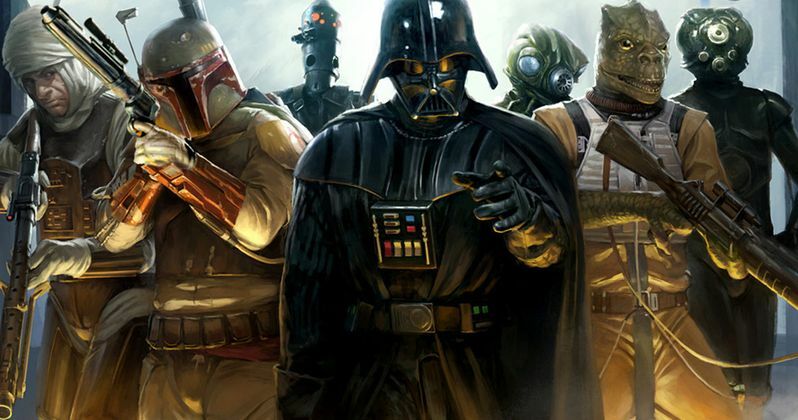 It is believed that Star Wars: Underworld revolved around the seedier side of the universe, and followed a group of Bounty Hunters. It was described as both a Western and a gangster epic. And was sold as a 100 hour movie. It seems likely that we'll see some of the concepts created for this stalled project used in the future. Otherwise, why wouldn't Kathleen Kennedy just write this off as something from a bygone era? It is believed that Star Wars: Underworld would have taken place before Star Wars: Episode IV - A New Hope, following the events seen in Star Wars: Episode III - Revenge of the Sith. And it would have filled in some of the gaps between the two, and may have introduced us to our main group of original trilogy heroes at a young age. Some of this same ground is being covered in both Rogue One: A Star Wars Story and the Disney XD animated series Star Wars Rebels. But it's such a vast landscape that it could still work. Some believe that Netflix is prepping a Star Wars live-action TV show for sometime in the near future. They already have four Marvel series and counting, which is why some view it as the perfect home. But that has never been confirmed by any means. At the time Star Wars: Underworld was widely discussed as something that might happen, it was often described as a show that would work best on pay cable. We'll have to wait and see how the upcoming movies pan out before we probably hear any real movement on this part of the Star Wars galaxy.